It was great to get a couple of winners last week, the first was Carlovian who was trying 5 furlongs for the first time since he came to us. 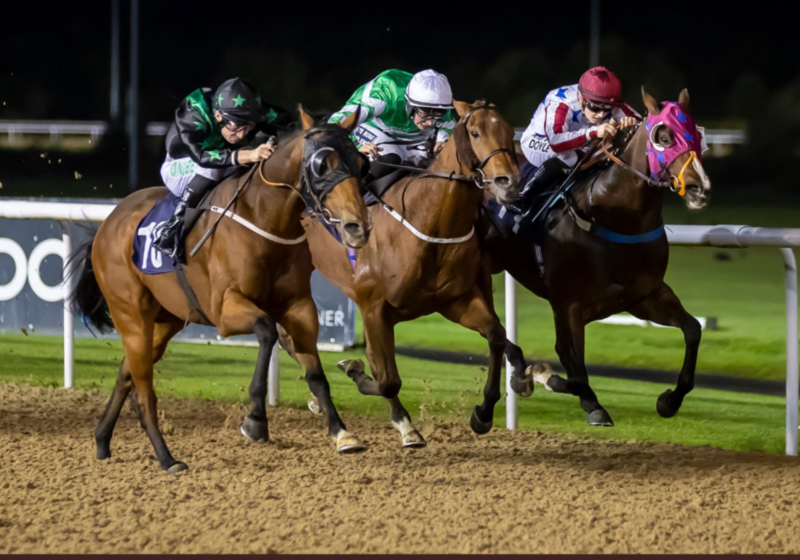 He had won 3 seven furlong races for us previously but since being fitted with a visor he has shown a lot more speed so we felt the drop to 5f was worth a go. I have to say after he missed the start I thought he had no chance but he found his stride quickly came home very strongly to win by 3/4 of a length under the all weather champion jockey Luke Morris. He is pictured below on the outside in the green and black colours of his owners Profit Pony Racing. 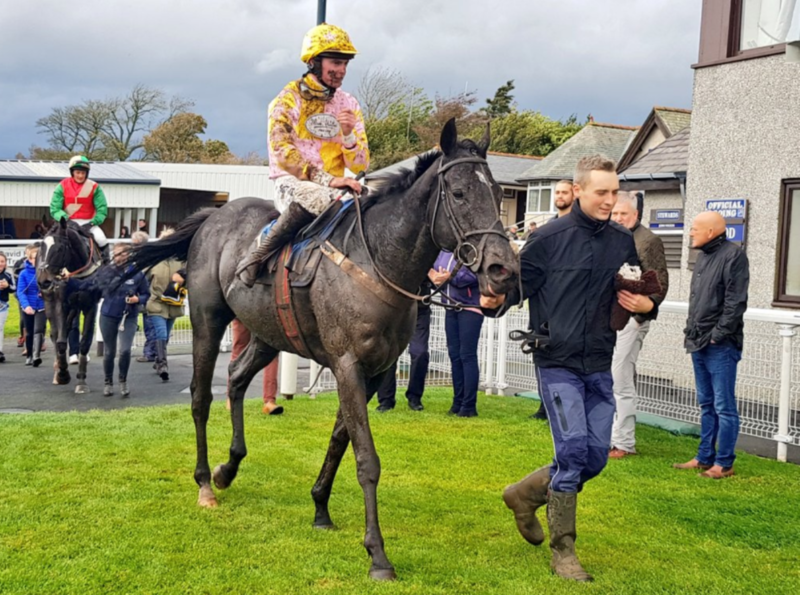 The next day it was up to Hexham with Take a Break, we claimed him out of a selling hurdle only two weeks before this race. Luckily the rain came in time as he acts well on soft ground, his jumping was not as slick as I would like but Jamie Hamilton did a great job, he didn't panic when he found himself near the back of the field and just let the horse find his own way over the fences before bringing him to challenge at the last and win going away. It was a first win over fences for him and he will hopefully be able to follow up early next month possibly back over hurdles. He is pictured below being lead in by Will, the Battenburg silks of his owners URSA Major Racing have been very lucky so far, let's hope their good run continues! To watch the race click here. These two winners continue the good run of form for the yard, we have now had 22 winners in the last 6 months from our small team of horses. We are still awaiting some rain so we can get some more of the jumpers out, there was enough to get a couple of novice chasers schooling on the grass the other day, click here to watch them.